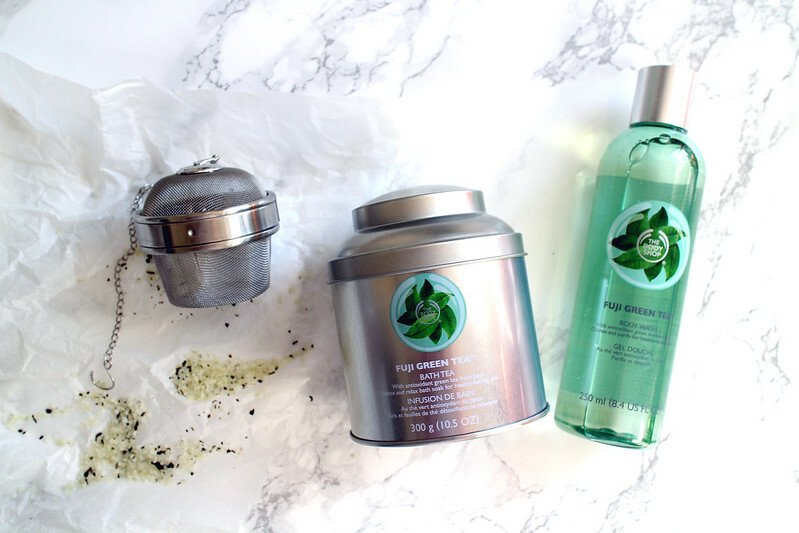 I want to buy the body sorbet and the body scrub from the Fuji Green Tea range, but for now I'm happy using these three. I wasn't really sure what to expect as far as the scent goes so I went into a store to try it before buying. Fortunately I loved the fresh scent that's just a bit different. I don't automatically think of green tea when I smell it, but it's really nice. Fuji Green Tea Bath Tea £ & Infuser £5 // I am a huge fan of bath salts so if a brand sells them, I'm going to buy them. Although you could just as easily pour these bath salts into your bath, I really love how the infuser actually looks like a tea infuser even when it's in the water. Yes it is unnecessary, but if you can't have fun with your bath when can you. These have the same green tea scent which lasts the whole time your in the water. Fuji Green Tea Body Wash | £ // This has the standard TBS shower gel formula which smells amazing, lathers up really well and doesn't dry my skin out or irritate it. I also prefer this style of packaging to the standard TBS shower gels.